Pole Buildings are our specialty and we take pride in providing this service to our clients. We offer full plan designs design and engineering structural design services to our clients who desire exceptional value, quality, and professional services. We cater to the Pole Barn industry and provide services to an array of customers across the rural United States. We cater to licensed contractors, owner-builders, farmers, ranchers, home owners, and public agencies. If you need a set of plans for a pole barn, you may place a request for our design services by clicking here. Our professional engineering staff and draftsmen provide detailed drawings to your exact specifications. There is no job too small or too large. We have over 20 years of professional engineering design experience and we aim to please our customers with innovative solutions to their problems. All pole buildings are designed to your geographical location for the proper snow load, wind loads, and earthquake zone. All plans come with a professional engineer's stamp on the drawings to ensure safety protocols have been implemented into your plans. We also include a set of structural calculations with each plan set. 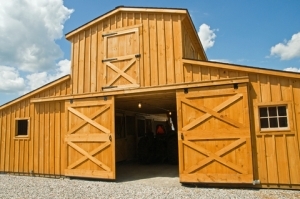 Do you have an existing pole barn or pole building that you need to add to? Our design staff can design the addition and ensure that the new addition fits your requirements and that it is built to last. For more information on our pole barn (pole building) designs, please visit our Frequently Asked Questions (FAQ) page.